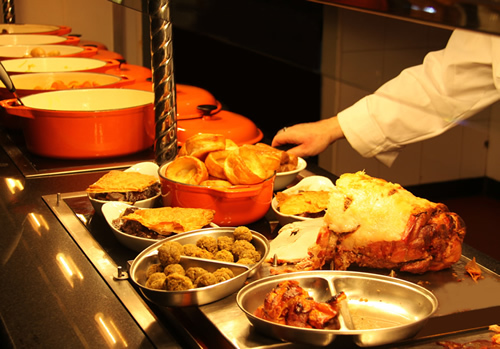 People love a well prepared and well presented carvery meal. There is something about value and choice that makes them sought after and we’re spoilt for choice in Telford. One the newest is Madebrook Carvery in Madeley/Sutton Hill. This building was a pricate residence in living memory, then became a Beefeater in the 1980s. Following a decline and a period closed, it’s now under new ownership and a new chapter in its life. Guest reviewer, Mark Edwards (Follow him on twitter @Telford27 ) went recently and shared his experience. I’m no food critic I mean I wouldn’t know the difference from a Crêpe Suzette and a pancake 🙂 but I do know what I like and that is a good carvery. I have tried several in the area and believe there are 2 types, the frozen veg type and the more expensive fresh veg type, now don’t get me wrong, there is nothing wrong with Aunt Bessie, I actually go to those more often but now on offer is a mixture of both. The Madebrook Carvery at Madeley has been under new management for a little under a year now but I have only just tried it over the last couple of months mores the pity. It boasts to offer locally sourced meat and veg at a very reasonable price, I have been 4 times now and not once have I been disappointed. Recently we treated 3 other members of our family to Sunday lunch there who are not local and they were very happy with their lunch. For a change I tried the pie option which was steak and onion and it was lovely. Unlike other carveries, other options are available such as pub favourites like fish and chips and grills, so something for everyone. Also, the staff are friendly and helpful and in my view the inside looks very nice with plenty of room. Check out their web site and give it ago I’m sure you wont be disappointed. Prices from £4.89. Tell us what you think. Leave your thoughts below. I agre with your review. We have eaten there too. It is good value for money. My parents each there regularly and they think its wonderful, have paid a lot more for worse meals elsewhere! Had a lovely meal for ten on dec 15th for my birthday, all different meals, cooked perfectly, friendly staff, have been a few times, can’t fault it. The Madebrook is well worth a visit the restaurant is clean and tidy the staff are very efficient helpful and pleasant the gentleman carving is polite and chearful plus you cannot fault the food hot and very tasty used plates were cleared away quickly we ordered sweets these were only a few minutes coming and the restaurant was quite full well done all at the Madebrook keep it up. I WENT FOR CARVERY TODAY ABOUT 5,15PM ON 11/05/2016 WHAT CAN I SAY THE FOOD WAS LOVELY,THE SERVICE OFF THE STAFF WAS CHEERFUL AND HELPFUL,AND THE DEATH BY CHOCOLATE DESERT WAS OUT OFF THIS WORLD.I WILL DIFFANTLY BE BACK SOON AS IM MOVING TO SUTTON HILL.I REALLY ENJOYED THE AMOSPHERE FOOD AND SERVICE. The best carvery I’ve had in a very long time, great fresh food, great service and good beer. Surely the best value carvery for miles around. My only issue with Madebrook is their policy of not allowing octogenarians with small appetites a child’s meal. Apparently it is “pub policy” that pensioners have to buy a full size meal.